Abel Gance's 1971 sound edition of his epic 1927 'Napoleon', which contains much of the silent original, with new material shot and added in both 1965 and 1971, and with sound synchronization from both the 1932 reissue and this version. 15-year-old dropout Mike takes a job at Newford Baths, where inappropriate sexual behaviour abounds, and becomes obsessed with his coworker Susan. The story of a 19th century English music hall (vaudeville) performer and life behind the scenes. Lovers undo a hairdresser from Beverly Hills around Election Eve in 1968. An aging, world-weary gangster is double-crossed and forced out of retirement when his best friend is kidnapped and their stash of eight stolen gold bars demanded as ransom. A film about the French general's youth and early military career. A stunningly effective anti-war classic. 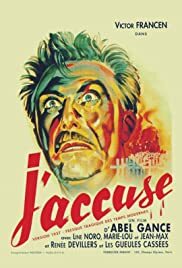 J'Accuse surely ranks as one of the most stunningly effective anti-war films ever made. Its early scenes involve a group of French soldiers who are compelled to go out on a hopeless and utterly pointless patrol. The men are instantly slaughtered by the Germans. The next morning, an armistice is declared. The men on patrol were the last to die. Think of the great anti-war films you've seen--like "Paths of Glory" or "All Quiet on the Western Front." In my opinion, Abel Gance's "J'Accuse" ranks with these masterpieces and, in its final scenes, even surpasses them. Jean Diaz is the sole survivor of the doomed patrol. Before the men leave the trenches, Diaz swore to his colleagues that their sacrifice would not be in vain--there would be no more wars. Diaz devotes his life to achieving this goal for which he sacrifices everything. Of course, he fails miserably, as the European powers prepare for a new and even more catastrophic war. In the final scenes, Diaz plays his last and best card in scenes that will not be soon forgotten by those who are fortunate enough to see this great film.